FIDE's first titles were awarded in 1950 and consisted of 27 Grandmasters (GMs), 94 International Masters, and 17 International Women Masters. The standards for FIDE titles were not formally defined, and were decided by a committee. In 1957, FIDE introduced norms (qualifying standards) for FIDE titles. The term "Grandmaster" (German: Großmeister) had been in informal use for strong chess players for several decades before its official institution by FIDE in 1950. At the same time FIDE also instituted the lesser rank of International Master, and two further subordinate ranks, FIDE Master and Candidate Master were later created. The requirements for each rank have varied over time, but generally require having demonstrated suitably strong skill in rated competition. Additionally the World Federation for Chess Composition awards Grandmaster, International Master and FIDE Master titles to persons who demonstrate high skill in the field of composing and solving chess problems (see list of grandmasters of the FIDE for chess compositions and Chess problem § Titles). The title Grandmaster is awarded to outstanding chess players by FIDE. Apart from World Champion, Grandmaster is the highest title a chess player can attain. Once achieved, the title is generally held for life. In chess literature it is usually abbreviated to GM. The abbreviation IGM for International Grandmaster can also sometimes be found, particularly in older literature. This title can be awarded to the players with an Elo rating greater than 2500 who achieve the required three title norms. Players with an Elo rating greater than 2700, such as Viswanathan Anand, Garry Kasparov, Magnus Carlsen, and Vladimir Kramnik are sometimes informally referred to as "Super-GMs". There are 44 players who would qualify for this title as of March 2019. Beginning with Nona Gaprindashvili in 1978, a number of women have earned the GM title. Since about 2000, most of the top 10 women have held the GM title. This should not be confused with the Woman Grandmaster (WGM) title. At 12 years and 7 months, Sergey Karjakin became the youngest person to qualify for the Grandmaster title. "International Master" redirects here. For the snooker tournament formerly known under this name, see British Open (snooker). The title International Master is awarded to strong chess players. Instituted in 1950, it is a lifetime title, usually abbreviated as IM in chess literature. 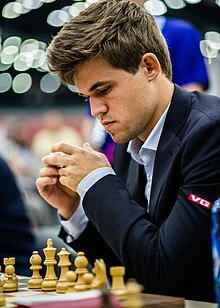 Normally three norms in international tournaments involving other IMs and Grandmasters are required before FIDE will confer the title on a player. IMs usually have an Elo rating between 2400 and 2500. Sometimes, though, there may be an IM who has not yet become a Grandmaster but has a rating greater than 2500. The IM title can also be awarded for a few specific performances. For example, under current rules, the runner up at the World Junior Championship will be awarded the IM title if he or she does not already have it. Current regulations may be found in the FIDE handbook. After becoming an IM, most professional players set their next goal as becoming a Grandmaster. It is also possible to become a Grandmaster without ever having been an International Master. Larry Christiansen of the United States (1977), Wang Hao of China, Anish Giri of The Netherlands, and former World Champion Vladimir Kramnik of Russia all became Grandmasters without ever having been an IM. Bobby Fischer of the United States attained both titles solely by virtue of qualifying for the 1958 Interzonal (IM title) and 1959 Candidates Tournament (GM title) entirely bypassing the usual process of achieving norms at each level only incidentally becoming IM before GM. However, the more usual path is first to become an IM, then move on to the GM level. At 10 years, 10 months, and 19 days, Praggnanandhaa Rameshbabu became the youngest ever person to hold an IM title in 2016. Introduced in 1978, FM ranks below the title of International Master but ahead of Candidate Master. The usual way for a player to qualify for the FIDE Master title is by achieving an Elo rating of 2300 or more. The current title regulations can be found in the FIDE handbook. Introduced in 2002, the usual way for a player to qualify for the Candidate Master title is by achieving an Elo rating of 2200 or more. Candidate Master ranks below other open FIDE titles, but above the WFM and WCM titles. Though the open FIDE titles are not gender-segregated, the following four titles given by FIDE are exclusive to women and may be held simultaneously with an open title. The requirements for these titles are about 200 Elo rating points lower than the requirements for the corresponding open titles. Not all leading female players have elected to take such titles; for example Grandmaster Judit Polgár, in keeping with her policy of playing only open competitions, never took a women's title. Woman Grandmaster (achieved at some time a rating of 2300) is the highest-ranking chess title restricted to women aside from Women's World Champion. FIDE introduced the WGM title in 1976, joining the previously introduced lower-ranking title, Woman International Master. The WGM title represents a level of chess skill lower than that of the unrestricted Grandmaster (GM) (2500) title, and WGM requirements are also lower than the requirements for the unrestricted International Master (IM) (2400) title. The winner of the World Girls Junior Championship is automatically awarded the WGM title. The current regulations can be found in the FIDE handbook. The winner of the Women's World Championship is automatically awarded the GM title if she does not already hold it, while the runner-up receives the IM title and a GM norm. Woman International Master (achieved at some time a rating of 2200) is next to the highest ranking title given by FIDE exclusively to women. FIDE first awarded the WIM title (formerly called International Woman Master, or IWM) in 1950. The WIM title has lower requirements than the unrestricted International Master (2400) title. The runners-up in the World Girls Junior Championship are automatically awarded the WIM title. The current regulations can be found in the FIDE handbook. The WFM title is just above Woman Candidate Master in the women-only titles given by FIDE. The minimum rating for receiving this title is 2100 and is lower than that of its unrestricted counterpart, FIDE Master (2300). Woman Candidate Master (achieved at some time a rating of 2000) is the lowest-ranking title awarded by FIDE. The requirements for the WCM title are easier than those for the unrestricted title, Candidate Master (2200). ^ "Handbook > FIDE Title Regulations effective from 1 July 2014". FIDE.com. FIDE. Retrieved 11 November 2014. ^ Wall, W. "FIDE History". Archived from the original on 2009-10-28. ^ a b c "FIDE Download Rating list". FIDE. Retrieved 2019-03-09. ^ "FIDE Official Handbook: Title Requirements". Fide.com. Retrieved 2012-03-12. ^ "Praggnanandhaa – youngest chess IM in history!". ChessBase. Retrieved 2016-11-02. ^ Felice, Gino (2017). Chess International Title Holders. Jefferson, North Carolina: Mcfarland and Company Holders. p. 1. ISBN 978-1-4766-7132-1. ^ Hooper, David; Whyld, Kenneth (1992). The Oxford Companion to Chess (2nd ed.). Oxford University Press. p. 450. ISBN 0-19-280049-3. ^ "Handbook". Fide.com. Retrieved 2012-03-12.